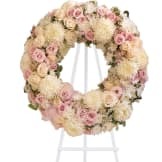 The Infinite Love Wreath stands as a testament to the circle of life that must be acknowledged even in our saddest moments. This bright and colorful wreath is a lovely way to share your love and sympathy. 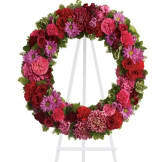 • Dazzling blooms such as pink hydrangea, hot pink roses and carnations, red roses, spray roses and carnations, burgundy dahlias, dark pink Sweet William, lavender daisy and button spray chrysanthemums along with fern and other fresh greens create a beautiful wreath that comes delivered on an easel. • This wreath measures approximately 27" in diameter. 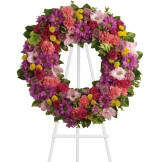 Flowers will be received by a Clora Funeral Home's staff. All of our flowers are designed and delivered by hand from a local florist in in Detroit.